Full, bushy plants with large semi-double flowers. A hardy annual, it can be sown where it is to flower. 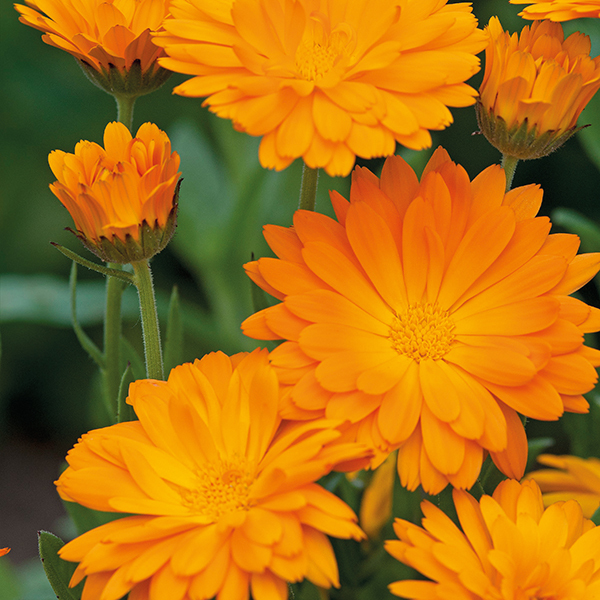 Easy to grow cut flower and summer border ‘filler’. Edible: Calendula flowers and leaves can be added to salads. Sow outdoors where they are to flower, 0.5cm (¼in) deep, directly into finely prepared soil which has already been watered. Seedlings usually appear in 7-21 days. Thin seedlings to 23cm (9in) apart. For a continuous display make sowings at two to three weekly intervals. Water well until plants are established. Late summer and autumn sowings will flower the following year. Remove dead flowers to prolong flowering season. For cut flowers pick when the buds have just opened.